The piano pedals demystified! Learn about the pedals and how to play the piano with easy pedaling techniques. Left: The Una Corda Pedal. 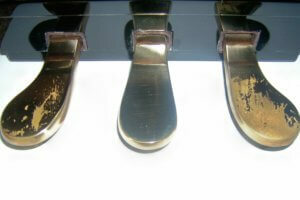 Middle: The Sostenuto Pedal. Right: The Sustain or Damper Pedal. The pedals of the piano are tools for changing the sound, or color of the piano tone. Piano pedals can create wonders when used properly, but also "kill" a piece if used without knowledge or care. Remember that the greatest "controller" when using the pedals are your ears. Whatever the instructions say in the score- if it sounds bad, change it! The piano pedal can look different and have different functions on different pianos. Some pianos have two pedals, some three. So what are they used for, and what are they called? 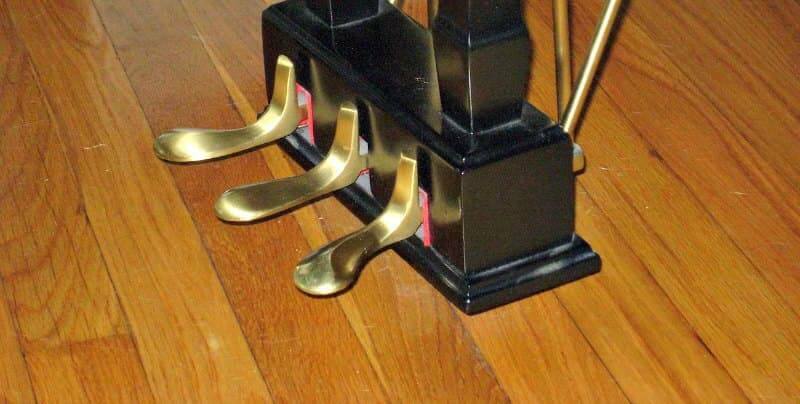 There are actually four types of piano pedals. But there are only max 3 on a piano. Three have basic "expressive" functions, but sometimes one of them has an "alternative" function of muting the piano (to not disturb neighbors). To the right is the most used pedal, the Sustain or Damper pedal. Sustain means to hold or keep something. In this case the sound from all the strings in the piano gets freed when the damper is raised from the strings and the notes played becomes blended for a rich sound. You will control the Sustain/Damper pedal with your right foot. After learning how to use it properly, you will probably use it in almost every piece you play! In the middle there is sometimes a pedal, which on a grand piano is called Sostenuto pedal. This pedal is also controlled with your right foot. Actually the word Sostenuto means sustained as well, but in this case the function "locks" only certain keys to get a "damp" effect. For example, you want a chord being held but at the same time play staccato, or short notes without blending them somewhere else. This is a fun effect, but very rarely used. Some grand pianos do not have this pedal at all, but have only the Damper and the Una Corda pedals. To the left is the Una Corda pedal. Again Italian, meaning "one string". On a grand piano you can see how the mechanism moves the whole keyboard to the right. In doing so, the hammers that usually hit up to three strings hit one less. On an upright piano all the hammers inside gets moved a bit closer to the strings, which slows the speed of the hammer and in this way making it possible to get a similar effect. The Una Corda pedal gives a "sordine" or muted effect, and makes it easier to play softer, but also with a subtle change in tonal color. This pedal you will control with your left foot. There is another function of the middle pedal in many upright pianos. The middle pedal when pushed down and locked to the side, allows a layer of felt cloth to be lowered in front of the strings. This makes the sound very much muted. The first piano pedal you'll use is the Damper pedal to the right. Playing the piano and using the piano pedals can be a bit difficult the first times. The "syncopated" pedal technique, which is the most common, is used to create a rich legato sound. And the "rhythmic" pedal technique, which can both be used to emphasize the rhythm of a piece, and where otherwise shorter note values needs to be played, just to bring out some "color". For the following exercises you will only use your sustain or damper pedal to the right, with your right foot. 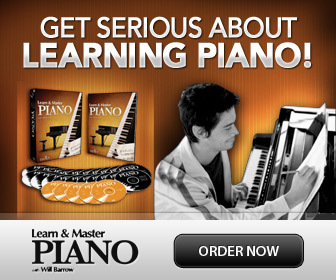 Tip: Check out: Piano Pedaling Lessons and Repertoire for tips and exercises in pedaling technique for beginners. First: Make sure you sit with the correct posture. You should sit on half the piano bench with both feet on the floor next to the piano pedals. Keep an approximate 20-30 cm distance from your torso to the keyboard; do not sit too close! Next: Put your right foot on the sustain pedal- to the right. The front part of your foot, so that your heel can stay comfortably on the floor at all times. Remember to always keep your heel at the floor! Start by counting 1-2-3-4 repeatedly in a steady rhythm. On every 2, press down the pedal and hold until 1, where you lift it. Make sure to make a smooth lift and not to let it make a noise! So it will be: UP-DOWN-HOLD-HOLD again and again. Repeat this as many times needed to make it smooth and natural. Next, play a note on every "1" and hold while you keep the pattern going with your foot on the pedal. You can change notes, or just play the same over and over. This is the "essence" of the Syncopated pedal! When using the syncopated pedal you did the "opposite" of your playing; when you played a note, your foot went up. When playing rhythmic pedal you will do the "same" as your playing; when you play a note, you will also press down the pedal! This is a bit easier. This will leave a "gap" between the groups of 4, and not let the notes overlap as in the Syncopated pedal technique above. The pedaling is sometimes written in the score, sometimes not. The way to write it has changed over time, and has in the past not been written too perfect- probably because it has always been expected by the pianist to add the pedal in good taste. And this is important! Piano's differ, the acoustic in different rooms differ. You always have to use your ears to hear if the pedal is good and serves the interpretation of the piece or not, no matter how well written the instructions are in the score. It is easy to follow, and rather exact. You follow the line with your foot, so to speak: Down, Hold, Up-Down, Hold, Up. Pedaling ~ Colors in Sound: Lessons and Repertoire.